This is an important book and, above all, a book of the now — some commentators have talked about the creation of a “pre-Neurotribes” and a “post-Neurotribes” public understanding of autism, which is probably correct. The amalgamation of Asperger syndrome into autism spectrum disorder within the DSM-5 in 2013 rewrote the definition of autism and Steve Silberman delineates the new landscape of the autistic spectrum and its population. Neurotribes is definitely a publishing phenomenon and has been accompanied by a vast number of gushing, enthusiastic and uncritical reviews [in the mainstream press]. I think uncritical appraisals serve the reader and the author badly — Neurotribes is a war-cry, a demand for recognition, and a work of advocacy written in a narrative style. It expresses opinions and perspectives that are (and should be) subjective, but not in a form that would appear in a textbook. This is not a criticism of the author or book, but of the expectations raised by over-enthusiastic reviewers. There is certainly potential to publish a “post-Neurotribes” edition of Neurotribes, in a shorter, less polemical and more factual form, with a bibliography. (You can find the bibliography on Steve Silberman’s website). My comments below are from the perspective of my involvement with delivering Autism Studies at University College Cork, and how students might relate to the text. For a summary of his perspectives you can watch Steve Silberman’s Ted talk (14 minutes), which is accompanied by an interactive typed transcript. John Elder Robison: a book that will make you rethink your views of this autism spectrum and how it all came to be. Give it a read. Robert Waltz (Autism Society of Minnesota): Is this book meant for neurotypicals or for people with ASD? First and foremost, I think, for neurotypicals. … If you’re interested in learning why you should pay more attention to people with autism, this is the book for you. The gushing, enthusiastic and uncritical [mainstream] reception to Neurotribes has raised expectations that this is THE autism and neurodiversity book. I recommend it, but with the warning that it is the subjective work of a journalist and it is not designed as a reference work or a textbook. (In fact, I found an eBook copy a helpful companion to the print volume, to search for quotes I remembered and could no locate again). A shorter summary or a second edition may become my de facto recommendation, if it is more factually-oriented, contains less of the personal interest back-stories and is structured in a consistent chronology. 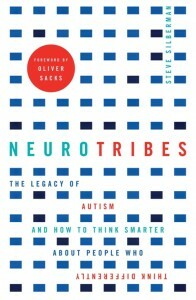 (Tyler Cowen makes similar points in a review of Neurotribes, by Steve Silberman, including “oddly, for all its praise of autism and autistic ways of thinking, the style of the book is remarkably non-autistic.”). Steve Silberman has a talent for humanising the history and personalities of autism, which sustains interest through more than 500 pages – the book is gripping and not an exhausting historical work. It is also (necessarily) partisan, selective and subjective. The human-interest narrative also jumps between epochs and occasionally reorders events for narrative impact, which disrupts the timeline of history. (He also omits Andrew Wakefield’s patent application [and the behaviour of others in the research group, of which he was not the leader]). 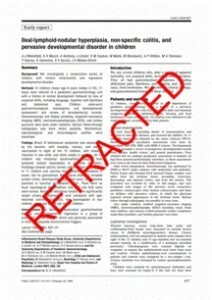 The time reversal is most disruptive in the description of events surrounding Andrew Wakefield’s discredited research and his professional misconduct hearing, which maximises the impact of his behaviour at the expense of clarity. This leads to the most serious criticism of Neurotribes, expressed eloquently by Simon Baron-Cohen in “Did Hans Asperger save children from the Nazis — or sell them out?” in the Spectator — that Steve Silberman inadvertatntly perpetuates exceptionalism. Neurodiverse people should be treasured for their humanity, not for their special skills or abilities. Most autistic people do not have special skills. The average intelligence of autistic people is below the population average; indeed the average on ANY treasurable skill is most likely below average. It is problematic to suggest that any group of people should be treasured for their exceptional abilities (or the exceptional abilities conferred by their genes, when expressed to a lesser extreme), rather than their humanity. The contribution of Jewish people throughout the history of autism is astounding and a revelation that Steve Silberman draws out exceptionally well. Equally, the mass migration of Austrian and East European culture into America, and its adaptation and assimilation into American culture, is an incredible achievement. Steve Silberman touches on the exclusion of black people from the history and current recognition of autism, which is a subject worthy of greater exposure. Steve Silberman has done an incredible job of researching and assembling a cohesive narrative of the history of autism, which is essential reading. On a tangent, I wonder if anyone would support the crowd-funding of a library of the history of autism, with a Creative Commons license? Many of the materials and references in the book are inaccessible to the public. Despite the time, money and energy required to access these materials, they probably have little or no residual commercial value to the publishers. A library of documents, photographs and video could support a new generation of autism teachers, parents and professionals. The Geek Syndrome in Wired, December 2001, the article that kick-started the book and the online AQ (autism quotient) test. How Autistic People Helped Shape the Modern World, and interview with Steve Silberman in Wired, August 2015. Rewriting Autism History in The Atlantic (although headlined as “newly discovered documents” they are better described as “ignored or suppressed”). Thanks for sharing your thoughts. I’ve enjoyed reading the various reactions to the book, it’s been an interesting time for autism discussions this past month. I guess I had a few thoughts on this post: first, you connect “postive” and “uncritical” reviews several times…as if it’s impossible to both critically examine the book and arrive at a positive assessment. I would say I had a positive reaction to the book…and I critically examined it. I think the “uncritical” label sort of implies that your more negative take is somehow qualitatively different, and I would say it’s not…you just critically examined the book and arrived at a different perspective than some. I don’t think this is quite right. First…the connections between Asperger and the Nazi party is vague but troubling…and I think the book presents it this way. His country and university were invaded…the book is clear about the fact that Asperger made compromises in reaction to this invasion. So…how people feel about Asperger will certainly (and I think permanently) be shaded by this facet of his life…I don’t think the book downplayed his actions here. Silberman does write that in his first speech to the Nazi party, Asperger touted the unique qualities of his clients and asked that their gifts be recognized, valued…and Silberman interprets this to mean that Asperger was making an effort to spare their lives from the extermination program. So…is this section of the book rehabilitation? I guess I can’t really see it that way…as he states in the book, Nazis were actively killing the disabled…I think it’s reasonable to take Asperger’s speech to be a defense of his clients, given what was happening to people exactly like his clients at the time. But the fact remains…it was a speech to Nazis, who he continued to work for. And as you state in your post, Silberman quotes the bit from Asperger’s speech where he hopes his clients can be incorporated into the war effort on behalf of Nazism…this hardly speaks to an attempt to rehabilitate his image. Any “defense” of Asperger I saw as relating to his description of autism in terms that we would recognize today…terms we now find to more accurate, constructive, beneficial. The fact that Asperger had these insights…which were lost for many decades…made for fascinating reading, at least for me. Also, both Asperger and Silberman emphasized repeatedly that autism could result in cognitive strengths…and cognitive disabilities. I didn’t think the various discussions of autistic intelligence took away from the disabling aspects that can also be part of the picture. In terms of Asperger and “rehabilitation”, I think it’s entirely possible to see the value in Asperger’s writing about autism without turning a blind eye to the historical situation he was a part of. And I thought Neurotribes did a nice job of striking that balance. With the “demonizing” of Kanner, you’re perhaps shooting the messenger here. There were some pretty fair allowances for certain issues; for example, Kanner made almost no reference to Asperger in his lifetime…and this could very well have been because Kanner was aware of his potential ties to Nazis…I think this would have been a reasonable reaction, so again, I don’t really see Neurotribes as rehabilitating one, demonizing the other…at least not in this regard. Probably a lot of people in Kanner’s shoes would have been uneasy with Asperger’s past, especially in those first decades after WWII. Neurotribes also described Kanner’s efforts to save Jewish colleagues from the extermination camps…I don’t think a demonizing effort would have had Aspergers offering children to the Nazis while Kanner saved many lives FROM Nazis. Where Kanner comes off more negatively are in passages about his views on parents, and his territorial efforts to make autism a narrow, rigid diagnosis available to very few children (and zero adults). I guess this is what I meant by “shooting the messenger”…Kanner does fare poorly in these sections of the book. I just saw that as being on Kanner, not Silberman, although I’m sure some will disagree. Kanner’s views on autism were profoundly toxic and damaging for many autistics and their familes…they remained toxic over a period of many decades. I didn’t feel like Kanner was being demonized, just described…it was his own words that I found most troubling, not any descriptions on Silberman’s part. I should probably stop rambling now. I recognise your point about connecting “positive” and “uncritical” reviews, and agree with you entirely, it was lack of clarity on my part. I do not think that the largely positive reviews I have listed, written by people affected by autism, are uncritical (quite the contrary in most cases). The mainstream press has carried some very enthusiastic reviews (not listed or linked) which I feel are not critical and do not serve the reader well. I genuinely think Neurotribes is timely, important, and a pleasure to read. My question is, how would you issue a “Creative Commons” license online to material copyright by other archives and publishers (which, unfortunately, the vast majority of this materials is)? Virtually every unpublished document I have managed to get a hodl of comes with a stamp clearly denoting that its copyright is retained by the institution or archive and it is not for general publication. So, I welcome any suggestions you have in this regard. It’s a noble thought, and, given the amount of money otherwise spent on autism, it’s surprising no foundation has sponsored a project like this to date. Absolutely correct, the copyright of archive material is held by publishers, foundations and private individuals. They are the only entities who can release it into the public domain or under a Creative Commons or similar licence. It would infringe their copyright for any other person or body to release their copyright material. I hope, given the research value of the archives of autism history, that those copyright holders will release it themselves or make it available through their own mechanisms. For instance, I have never seen Asperger’s 1938 “Das psychisch abnorme Kind”, Wiener klinische Wochenschrift and it is hard to obtain. The publishers (Springer AT) kindly informed me that it is available for personal research use by visiting the library of the College of Physicians in Vienna, Billrothhaus (http://en.billrothhaus.at/). This would represent a significant expense to most autism researchers and only a minute income to the copyright holder. This paper alone would settle some divisive debates that feature in NeuroTribes and In a Different Key – possibly affecting the future terminology of autism diagnosis (i.e. do people wish to continue or end the use of Hans Asperger’s name?). I have no idea what commercial value Springer or individual interviewers would place on their archive material, but it would be worth exploring whether purchasing or requesting a goodwill donation of the rights for the purpose of a CC release is possible, perhaps through community funding, an academic department or a charitable organisation. Stuart, I believe I have the 1938 paper you are referring to. Would you like me to email you a copy (for personal, non-commercial use only)? If so, let me know your best email. While some of these documents required a fair bit of creativity to get, I believe this one was in fact just held at the Bodleian Libraries in Oxford (through an online subscription.) So, if you ever want to make the trip to Oxford – and please let me know if you do – I believe you could also look at it here simply by applying for a readers card.